Happy Friday! I’m interrupting BA Friday to join in on my friend Beckie’s state pride tour! I’m participating on the final day, so be sure to go back and check all the other states. They’re incredible, I tell ya. I’ve shown off my beautiful state of Michigan before, and I consider myself lucky to live in one of the most beautiful parts of it. 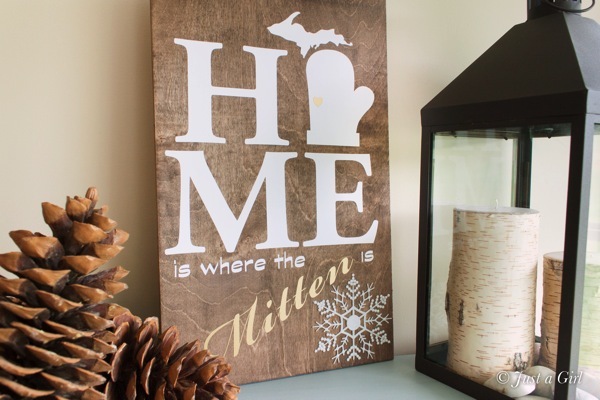 Michigan is known as “The Mitten State” ’cause…you know…it looks like a mitten. And since we see our fair share of snow each year, it’s only fitting. Get it? Fitting? Someone stop me. Because I did the first part at night and because I’m an airhead after 10pm, I forgot to take a picture of it. Basically, grab a scrap piece of wood from your garage and put some stain on it. I used a paper towel to do that. Because I’m fancy. The next part is always my favorite. 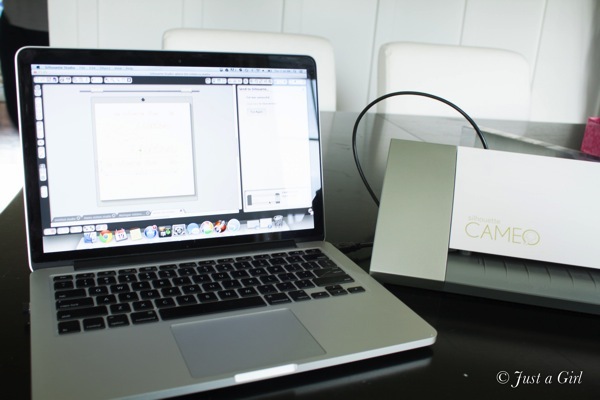 If you have a Silhouette machine or some other vinyl cutter, you’re in luck. If not, you’ll need to get fancy with the scissors. I love playing around with the different images and figuring out the layout I want to use. 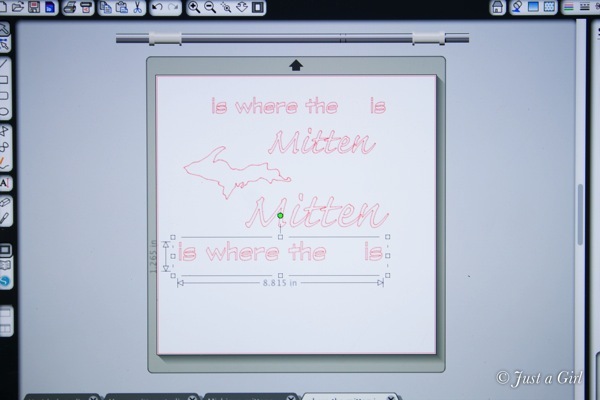 Luckily, Silhouette offers all the fonts I need and plenty of graphics–yes, even Michigan. After I attached all the vinyl, the snow flake was a must. Mittens, snowflakes, and Michigan. We go together. There’s always that population of people clawing their way out of this state and the harsh winters, but I have never wanted to be anywhere else! It’s a beautiful place to live, and it’s full of good people. 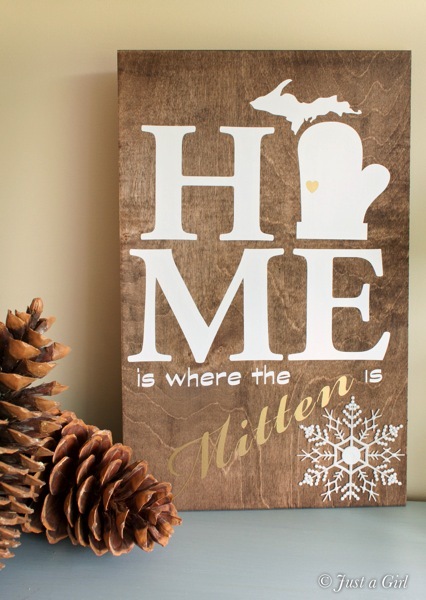 So yes, home really is where the mitten is. Alright, if you’re coming over from Gina at The Shabby Creek Cottage–welcome! If you’re leaving me to go somewhere else, how about you visit Jennifer Rizzo. She’s showing off Illinois, so she knows about snow too. I’m a huge fan of our fair state too! 🙂 Adorable project! I <3 Michigan … especially the UP! Cute project. Love this! It came out so cute! I have a LOVE shirt where the “O” is the lower peninsula positioned crooked like a heart. 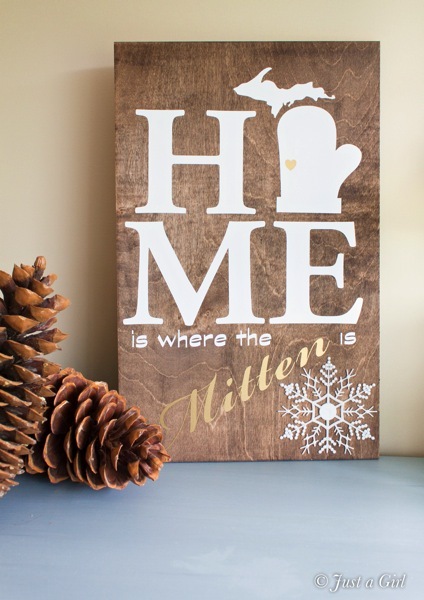 I would love to recreate this little sign for the Winter (and put my little heart by the Tri City Area). I have been to Michigan once and it a great place to spend some time . i really liked it there.. This is such a cute project!! I love living in West Michigan! I love our pleasant peninsula too! Going to have to make one of these for our winter mantel, I think! Thanks for sharing! I love your sign – very creative! I live in the Upper Peninsula, so thanks for representing the UP. So many times we are forgotten. I love your blog and all your energy…My daughter and her family live in Grand Rapids so as soon as I discovered you were in Mi. I kept an eye on your blog and love your taste in decorating and your crafty projects are very cool. I moved away from Michigan when I was 8, but it’s still my favorite state. Since we still have family there we visit as much as we can, and our kids have spent many a summer hiking at Sleeping Bear Dunes and canoeing the Platte River. And I’m convinced soft serve ice cream tastes better in Michigan than any other state. : ) I adore your sign!